In this gem of a book … Carter drives an Aussie road train through the red dust of deliberate obfuscation and misrepresentation that is the hallmark of IPCC reports and other climatic claptrap. This is an enthralling book, a sunrise of calm analysis and penetrating good sense – John Dyson (Amazon UK review). Surely … one of the most important rigorously scientific, responsible and level-headed reviews of literature relevant to the whole [AGW] debate yet published … a pivotally important book – Christopher Cooper (Amazon UK review). What an excellent book: clear and concise in every way. All of the various tricky subjects were covered and all reasonable questions asked and answered – John Wellock (Amazon UK review). 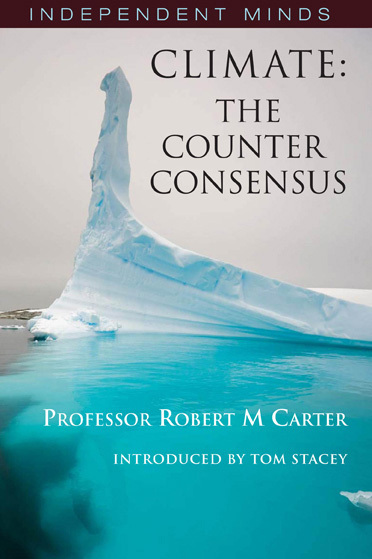 Just been reading … Climate the Counter Consensus – and it’s a cracker. By the end, you’re left feeling … that the scientific case against AGW is so overwhelming that you wonder how anyone can still speak up for so discredited a theory without dying of embarrassment – James Delingpole (Telegraph.co.UK). A well-written account of much of the deep corruption of our scientific inheritance which has been central to spread of this [AGW] fantasy – Ray Evans (Secretary, Lavoisier Society; Quadrant review). [The book is] an absolute gem and should be in every library and school in the world - Dr. Hamish Campbell (Te Papa, National Museum of New Zealand). Professor Carter has worked, taught and studied in this field [palaeoclimatology] for 40 years. It is refreshing to read a book from someone who has worked at the coalface – Wilson Fletcher (Amazon UK review). Carter takes a scalpel to the so-called facts of ‘global warming’ that are churned out and unquestioningly accepted …. [his] book typifies the mission of the Independent Minds series, namely to replace political correctness and received wisdom with common sense and rational analysis – Philip Stott (The Clamour of the Times). Bob Carter’s new book …. is excellent from every perspective. He uses gripping language and is very precise in everything, covering the whole range of issues from the science through the social and economic implications to the fraudulent behaviour of AGW people – Dr. John Nicol (retired JCU physicist, pers. comm.). Bob Carter ….. has an extraordinary capacity to present well-researched and referenced science in a way that the layman can understand – Roger Helmer (EuroMP, UK East Midlands). The book is an amazing tour de force of information and commentary regarding the full scope of climate change science, climate modeling and climate change policy. …. (It) is must reading for policy makers, scientists and those who simply want to understand why more and more scientists have become either skeptical of, or are discarding, the hypothesis of Anthropogenic Global Warming – R. Burtner (Amazon USA). … For those interested in the scientific discussion (as opposed to the emotional and political one) it is an absolute must-read – Professor Jan de Ruiter (Amazon USA). Professor Carter demonstrates a rare combination of talents – an accomplished researcher who writes lucidly. He fluidly takes the reader through the entire sordid mess of what has become generally accepted climate science and he does it in a clever way – Ken Haapala (Science & Environmental Policy Project). A great read, well presented, and strictly factual and without any of the hyperbole so often seen from the [climate] alarmist camp – Keith Moore (Amazon UK). I have read several books on the subject of global warming …. and this is the best. An excellent book written by someone well qualified but it is easily understood by a layman – Neil Stuart (Amazon UK). Climate: the Counter Consensus … is one of the best books I have ever read (and I have read a lot) – Professor Antero Jarvinen (Director, Kilpisjarvi Biological Station, University of Helsinki).